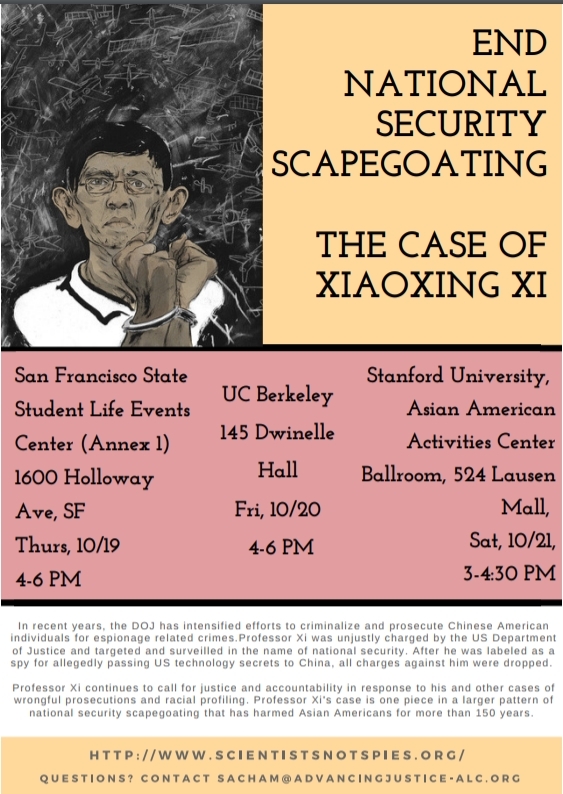 CAA is pleased to announce an October 19-21 Bay Area speaking tour featuring Professor Xiaoxing Xi at San Francisco State University, UC Berkeley, and Stanford University. The purpose of the tour is to raise awareness of how Chinese Americans are being targeted in the name of national security, and to engage the broader community in efforts to end racial profiling. In 2015, Xi, a naturalized citizen who was chair of the physics department at Temple University, was wrongly accused by the U.S. Department of Justice (DOJ) of sending restricted American technology to China. Though exonerated of all charges, Xi was not compensated by the U.S. government for any loss, which included his removal as head of the Temple physics department. Xi’s case is one in a number of recent similar cases of wrongful accusation of Asian Americans by the Department of Justice. It’s a trend tied to the DOJ’s intensified efforts in recent years to criminalize and prosecute Chinese American individuals for espionage-related crimes. CAA is a member of a coalition of organizations and individuals working to raise awareness of and end national security scapegoating based on racial profiling and the targeting of communities based on their identity. Learn more about Prof. Xi’s campaign for justice at www.scientistsnotspies.org.